Notes from the Plumb Tree: Here Comes Trouble! Here she comes! Look at that trail of destruction behind her. 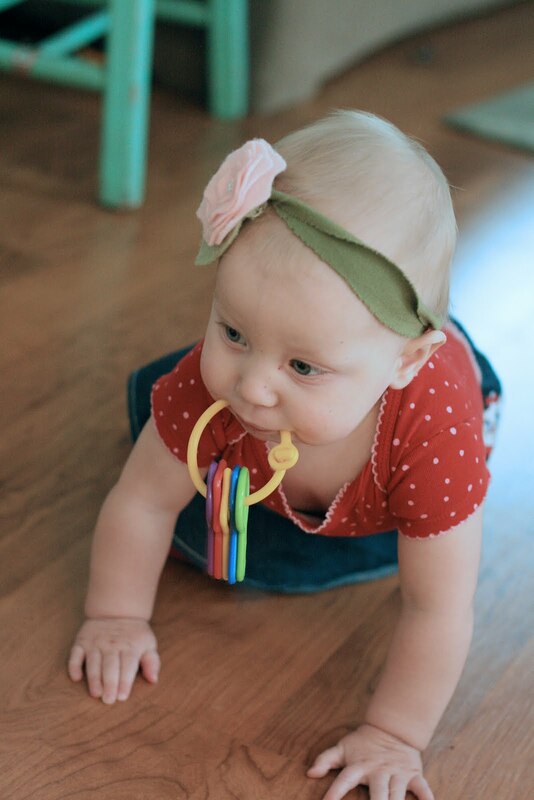 I would say this is quite an inventive way to carry toys when you are busy crawling, wouldn't you? Last week I found Tessa's walker had a bungee cord hooked to it when I went to get her out of it. Turns out Hunter was using his bungee cords as a tether so that Tessa couldn't run into his toys as he was playing. He would hook her walker to random pieces of furniture. (What? Oh yes, well, we do put bungee cords in Hunter's stocking at Christmas. It's amazing what an inventive boy will figure out to do with them. They are wonderful stocking stuffers). 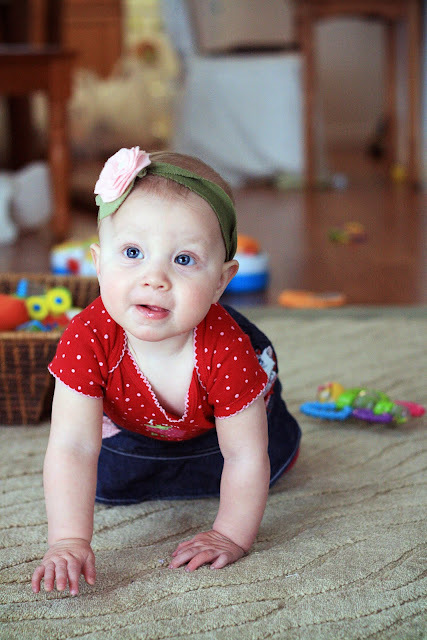 This week, Tessa has finally mastered the art of crawling. She started trying two weeks ago, and now she get anywhere she wants and quite quickly. Hunter's bungee cords are no longer working out for him, poor boy since she no longer needs to be confined to the walker to be mobile. I set her down where he and Ainsley are playing, and I hear screeches and screams from them as she knocks down or eats their toys they have set up. On the other hand, when the mood strikes, they can be wonderfully patient with her and play with her for hours. 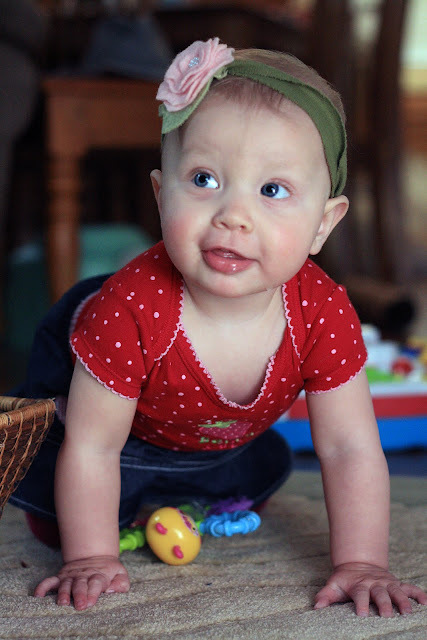 Her new skill of crawling also came hand in hand with a new sound, "Bab." She "Bab bab bab"'s all over the house. We say she talks to Bob. The only problem is that we don't know a Bob. He must be her new imaginary friend. We all think she's really super cute. Look at those chubby legs and arms. I was getting her dressed and couldn't stand it. I had to get a picture of all that chubby cuteness. Tessa, however, just wanted down. 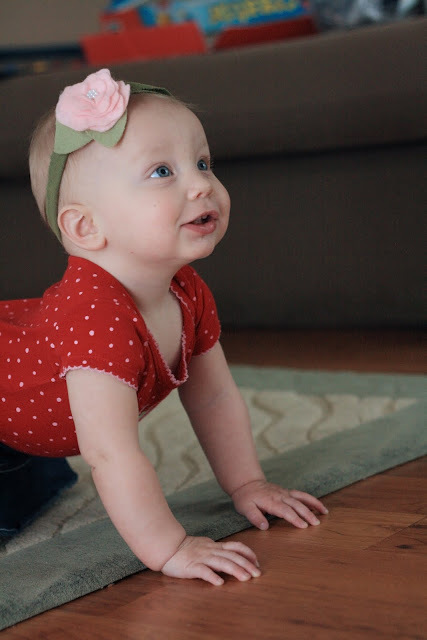 Oh.my.goodness...I feel like I need to pinch her little cheeks. What a cutie! Hunter is an innovative guy! I'm impressed! Oh, and you've got 52 goals for the year, not just one! I love that idea and am seriously thinking about doing it minus the hair dying, of course! Hunter's bungee cords made me laugh! What a smart little guy he is! lol!